Marcoliani is an Italian brand established in 2000. It belongs to Calzificio Italiano Srl company which was founded by Giuseppe Gatti. Nowadays Marcoliani specialises in ‘one-size-fits-most’ (not ‘all’!) socks – invisible, mid-calf and over-the-calf ones. They usually fit UK 6 – UK 10. Marcoliani socks are made in Italy. The brand uses high quality materials: extra-long staple Pima cotton from Peru (sometimes 3-ply), extrafine merino wool, silk and 2-ply cashmere. Most socks are made of blends: for example, 80% cotton + 20% polyamide or 80% merino wool + 20% polyamide or 80% cashmere + 20% nylon. 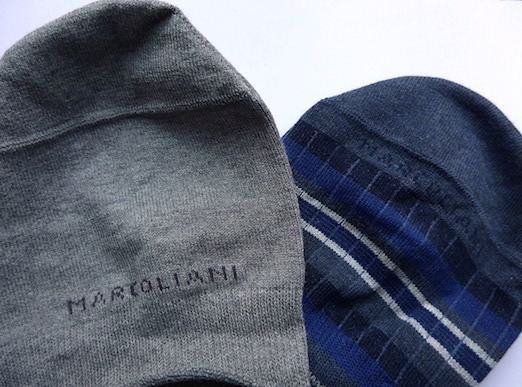 Some Marcoliani socks feature hand-linked toes, but there are also socks with non-flat seams. Of course, invisible socks have silicon bands in the heel area. Marcoliani socks are available in a wide range of shades, colours, patterns (argyle, solids, houndstooth, bird’s eye, windowpane check, horizontal, vertical and diagonal stripes, polka dots, floral and fancy patterns). Colours: green, pink, red, beige, black, navy, blue, purple, light blue, ivory, brown, orange, burgundy, grey, khaki, white, etc. You can buy Marcoliani socks at MrPorter.com (prices start at 8 GBP, excl. VAT), CustomShirt1.com (prices start at 19,5 USD, no VAT), MesChaussettesRouges.com (only cashmere socks – 65 EUR, incl. VAT), SocksFox.com (from 10,95 GBP, incl. VAT), HarryRosen.com (from 24 USD, no VAT). Sometimes these socks are available on sales with 30% discount.